We asked several of the acts performing at this year's Camden Crawl (DiS host Friday 20th June at The Underworld) to share their favourite places to eat in London. Rowdy Superstar: South London. Brixton indoor market has become my secret hidden place in London to eat. I love Italian soul food and Bellantoni's is the best in London. Chef and owner Dario Bellantoni cooks with heart. Honest do a killer burger and Franco Manca's sour dough pizza is a f***ing #situation. Nic Nell: St John Bread and Wine by Spitafields. Best nose to tail eating I've had. Really reasonably priced. They give you a load of bread. Then order two £7/8 starters a head to share and you're sorted. The menu changes daily. My favorites have been the salt beef and the artichoke soup. Duck hearts were amazing too - don't be scared off by the weird stuff! Rebekah Raa: Stringray in Highbury is a cosy italian place which has good wine and a gluten free option for all of its pizzas and pasta. Pizza is between £5.45 and £7.45 (plus £1 for GF) and there's lots of options. The smoked salmon and avocado pizza is surprisingly good. And they are generous with artichoke pieces. Faith: Our favourite place to eat in London is Little Georgia in Hackney. It's a cute little place, full of vintage gramophones and telephones, we go to for brunch whenever we stay over after a show. 'Snazzy beans' is the best thing on the menu, it's spiced beans with carrot and coriander and i'm sure a bunch of other secret ingredients.. it comes with wholegrain toast and scrabbled eggs, the perfect hangover cure. The coffee is divine too. Allpress, Redchurch St, E2 - Known for its in-house roasted beans - which makes pretty much the best coffee in London - the food is damn great too. The Green Goddess sandwich is all kinds of good, but for something simpler, their boiled eggs (with the deepest amber yolks I have ever seen) and sourdough soldiers is the dish I crave. Tourmet Delights: The Best Thing Various Bands Ate on the Road in 2013. Seeing as few of the above are in or near Camden, and some of you may end up hungry at this year's Camden Crawl, I thought I'd share a few places I like to stuff my face at before gigging in Camden. 1) Hache Burgers (pictured, above) are sublime. People talk about MEATliquor, Five Guys and various other blog-hyped burger joints, but there's something about Hache that seems worthy of the hype. The standard burger is delicious but when you throw in options that include everything from peanut butter to mint yogurt, you know it's not your average side-street gastro-chow. It's on Inverness Street and booking is advised but not essential. Tip: Wash down that cocktail-like burger with a Mojito at Made in Brasil, a few doors down. 2) Manna is a vegetarians dream - and good for vegans and people with allergies too. It's a little pricey, but then it is near Primrose Hill (around the corner from the old Creation Records offices). Their restorative salads are delicious belly-fillers, the curries are fantastic and pretty much everything on the menu will leave you feeling rosy-cheeked and ready for several hours of bar-hopping. 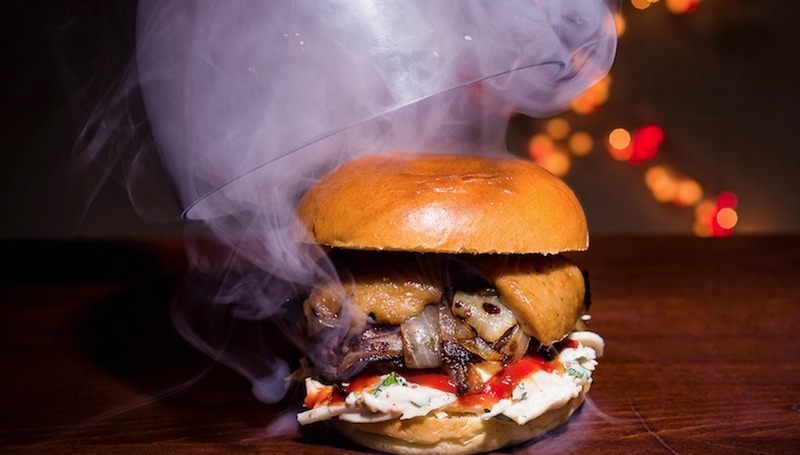 3) Smoke 'n' Roll - this pop-up-ish place inside the Black Heart (tucked away in the side-streets near the Underworld) does a mean pulled pork sandwich, and the ale selection is pretty good too. It's one of the Camden Crawl venues so may get busy during the festival, but the guy in the hatch beside the bar is damn quick (although you will have to order from him, rather than from the bar). Competition: WIN! Tickets to this year's Camden Crawl. For more details about the Camden Crawl visit thecamdencrawl.com. Related: Good places to drink before going to gigs.